George Horse Capture, Sr. is the field manager of Fort Belknap Ventures, Inc., a tribal enterprise that develops and markets traditional Indian Art. 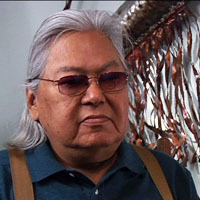 For many years he was curator for exhibits at the National Museum of the American Indian. In his interview, he shares the Aaninin, or Gros Ventre, origin story. Aaninin (Gros Ventre) Origin Story - George Horse Capture Sr.